After about three weeks of picking up leftover scraps that were clearly being eaten by birds and rodents , I returned to find the fruit finally missing . Nothing was left except for skins and stickers from the fruit . He was smart , he wasn't going to let an opportunity of free fruit go by . He was removing the stickers off the fruit before consumption . The banana's were being opened from the side , the mango seeds were clearly being sucked clean . I believe I was feeding a yowie but how could I prove this , I wanted to tell everyone but was aware of the ridicule that I would face . I kept an audio recorder in the area which didnt seem to bother him and recorded him running , tapping rocks together and breaking branches . I also recorded my first two vocalisations which sounded like a chimpanzee . I put my trail camera there and tried to trick him but nothing was working , he didnt like it and avoided the camera . I finally gave in and persued a true friendship , no recorders , no trail cameras , just what I'd hope was a mutual interest in each other . I got an immediate response . I hopped out of the car the following weekend and was greeted with massive stomping noises on the ground . I froze , I experienced fear , excitement and adrenalin at the same time . A tingle went down my spine and the hair on my arms stood up . I just thought OMG ! he's communicating ! He was communicating alright but I had no idea what he was saying . For me this was confirmation that I wasnt imagining things . 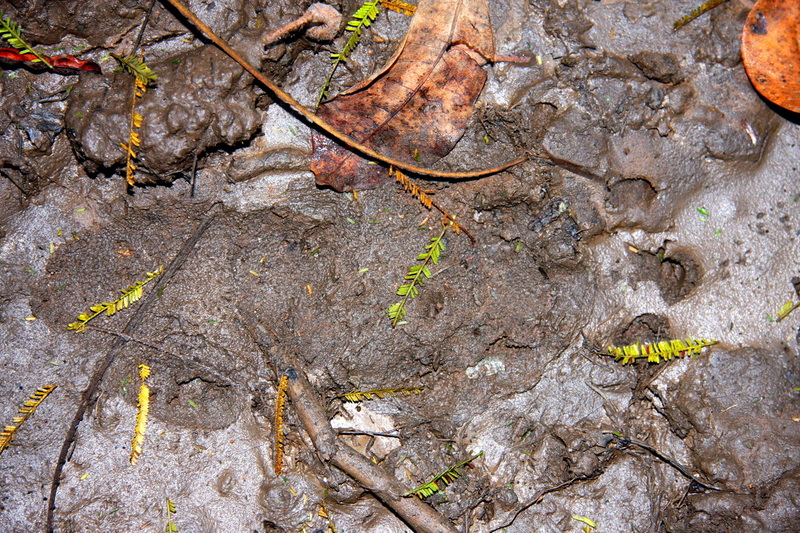 There was a lot of muddy patches on the trail into this area and I then wondered if he was leaving footprints . I checked the next time I went in there and sure enough , there were two footprints in the mud . Both were clearly not human .